Things have to get fairly dire before your entire student body, well, 97% of your student body, boycotts your school due to “dangerous conditions”. But, that’s precisely what happened at Lowell’s Riverside School on a Monday morning in late March, 1971. Of the school’s 205 students in Grades K through 5, just six showed up for school. Instead, starting at 8:15 AM on March 22, their parents – mostly their mothers – began showing up to picket in front of the school, at Woburn Street’s intersection with Eugene Street. Robert Healy, Jr., Assistant City Manager, soon arrived at the picket line, which had been announced and expected before that Monday morning. He arrived with little to offer. Of the city’s $2.2 million school renovation budget ($12.5 million in today’s dollars), precisely nothing was destined for the Riverside, or any of the city’s other older ‘wooden schools’. The picketing parents listed and responded by giving Healy a list of no less than 24 problems that they had identified at the school. 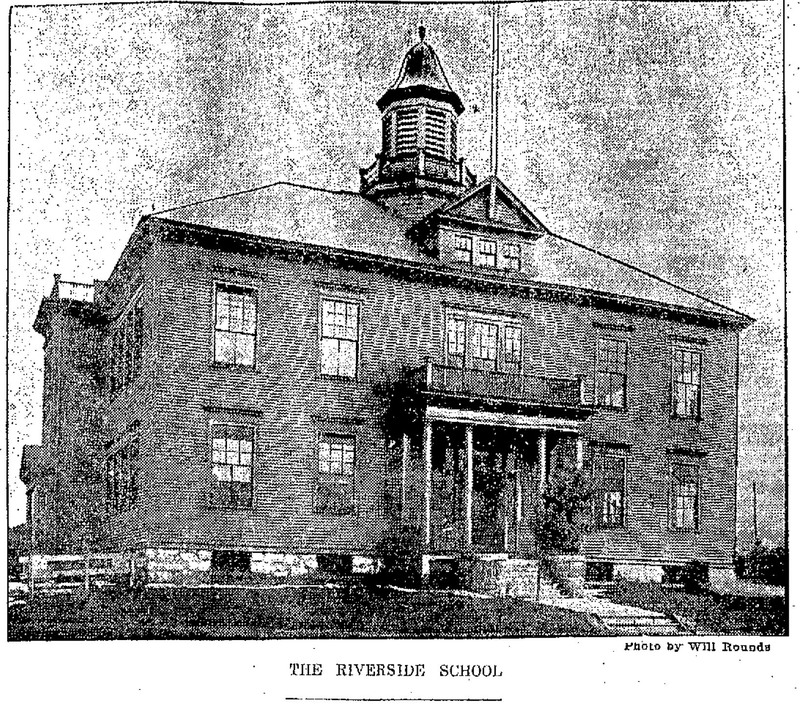 The Riverside, built in the years leading up the twentieth century, had once been a gem of Tewksbury’s school system in the years before Lowell’s annexation of the Wigginville neighborhood of South Lowell. With its eight rooms (luxurious by period standards), the school was – spacious -; so, spacious, in fact, that two of those rooms were specially designated for its students’ recreation. A 1910 Lowell Sun article lauded the school’s playrooms and greatly admired the dollhouse and doll tea set that had been built by the students. Sixty years later, by the early 1970s, things had clearly changed. The parents’ 24 problems included: crumbling plaster, peeling paint, dim and missing lights, a failing oil heater, shoddy wiring, and a shortage of school supplies. That wasn’t all. The school was actually unsafe; the parents charged. The roof leaked so much water that the wiring in the school’s attic was submerged in puddles. These were the days before parents worried about mold exposure. Healy, representing the city manager’s office, wasn’t unsympathetic. He just had a really tough position to support. He listened to the picketing parents. He then explained that the damage to the school’s roof had been a result of maintenance to the school. An air raid siren had to be removed, and it was – just a month earlier. The weight of the siren had damaged the roof. In fact, he said, as the picketers amassed on that March Monday, public works crews had arrived for their second day of work to fix the leaks. And, a wiring inspector would arrive later that day to review the electrical problems. The city would fix the Riverside. Parents quickly pointed out that maintenance workers wouldn’t fix all 24 problems on their list. “History is not being taught in the fifth grade because we have no books.” One parent said. “Geography is not being taught in the fourth grade because we have only seven books and they have pages missing.” Another contributed. One Riverside teacher later confided that she had been forced to use spelling books that dated from the 1920’s. School officials responded by denying they knew that there was a problem. The parents insisted that they had contacted the superintendent’s office. They also reminded school officials about their promise regarding the Joseph G. Pyne School. When the J. G. Pyne had been built, a few years earlier, the plan had been to move the Riverside children there. In fact, the School Committee, in 1970, had voted 5-2 to move the Pyne’s seventh and eighth graders to the Moody in order to free up space for the Riverside students. There was one problem, though. No one made sure that the Junior High students at the Pyne minded going to the Moody. They did. 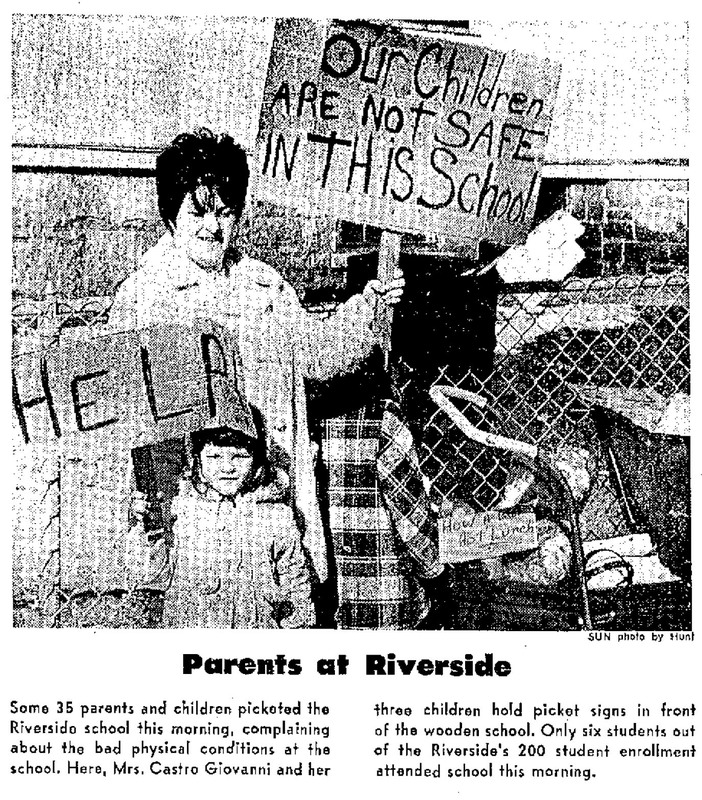 To accommodate the “almost unanimous” wishes of the South Lowell citizenry, school committee officials left the J. G. Pyne students at the J. G. Pyne, and the Riverside students at their crumbling Riverside. And this led to a mid-March strike where parents kept 199 of the school’s 205 students out of school for a day in protest. The parents’ list continued. During the previous winter, classes had been held in classrooms where the temperature hovered near 40 degrees. With no heat, the students stayed in their coats all day. As Assistant City Manager Healy listened to their list, he acknowledged that the parents “had a case”. He promised to fix the school’s supply problems almost immediately, saying that he would talk with the school’s principal and central office. All they have to do, he said, is call downtown and they’ll get new supplies. 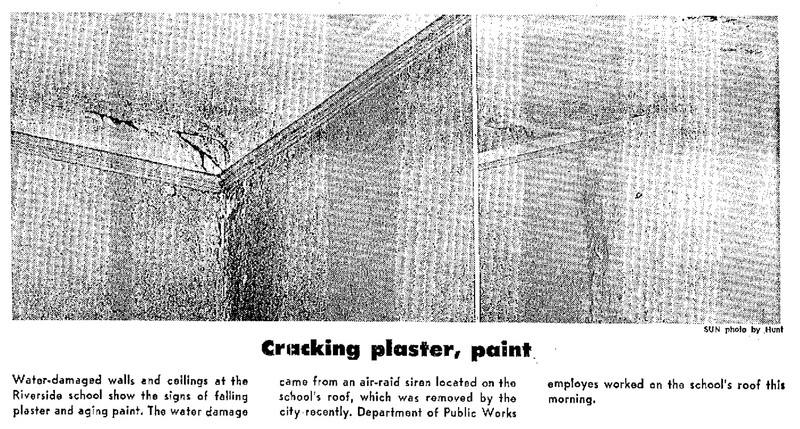 Healy knew that the DPW had been addressing the school’s plaster issues, but also acknowledged that he knew it to be only ‘band-aid work’. Superintendent of Schools Wayne Peters also responded to the picketing parents, saying conditions at the Riverside weren’t really any better or worse than any other old school in the city. “We could close the Riverside tomorrow if parents and members of the PTAs would be willing to transfer junior high school out of the J. G. Pyne school and bus some students to the Reilly.” Peters said. Asked about the school’s extremely low attendance on the morning of March 22, 1971, Peters dismissed it, saying that they would teach the six students. They would teach just one student. “It’s only the students who are suffering”. Officials did not perform their investigations into the school’s dismal conditions publicly. However, over the following four weeks, Superintendent Peters held two meetings with parents to iron out differences and also met with the school’s principal and her teachers. The principal’s resignation and retirement followed one month later, in mid-April, reportedly at the superintendent’s request. Repairs came, and the school remained in use, up through the 1981-1982 school year, when its students were, indeed, moved to the J.G. Pyne School. From personal experience, I can say that I have fond memories of the school, and can still remember its huge classrooms, with long, shiny wood floors, and old woodwork. I was a member of the school’s final kindergarten class. 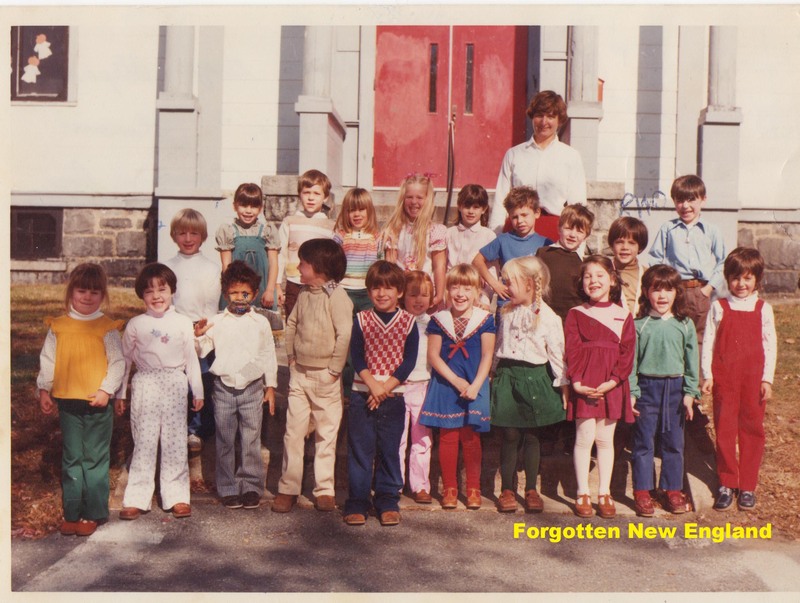 Riverside School’s Final Kindergarten Class – Spring 1982. In the years since, I helpfully marked myself with initials that are floating above my head. Although my five-year-old self enjoyed my time at the school, the maintenance occurring between the time of the Parents’ Strike and this photo ten years later, didn’t quite extend to repainting the main entrance doors. Today, the Riverside School houses the B.R.I.D.G.E. (Beginnings Respect Independent Diversity Guidance Education) Program at the McHugh Alternative Middle School, a partnership between Middlesex Community College and the Lowell Public Schools. Established in 1997 for 24 Lowell public school seventh and eighth graders, the program today has grown to serve 50 students. The B.R.I.D.G.E. program serves students who have experienced past behavioral or attendance problems in traditional school settings. Please email me a proper copy of that shot. I was also a member of that class. Hi Lisa, thanks for the note. I’ll get the original later this week, scan, and send it to you. Loved it., I graduated there in 1949 and still have my graduation picture and also third grade class picture!